I've managed quite a bit of sewing over the last couple of weeks, well the weather hasn't been very inviting, so I've stayed indoors and sewed. Here are just a few of the things I've been up to. I've signed up to the Craftsy class on Modern Quilting, and the first class was on random squares. I decided to just make a small sample of this one, using squares that finished at two and a half inches. It's a quite useless size, but it hangs quite happily in my sewing room and I'm quite pleased with the way it looks, especially the sewing themed fabric. I haven't signed up to much in the way of BOMs this year as I have so much to do with my City and Guilds class, but I am doing the Sugar Club BOM, just to keep my hand in with some traditional piecing and to try and improve my accuracy. This is the first block that I made. Last year I did the Aurifil Buzz BOM, as I always enjoy having some hand sewing on the go. I finally finished it and put it all together. Not an unqualified success. When I had finished quilting the sashing the stitched blocks were all baggy. So I stipple quilted around all the stitching and then outline stitched the designs. That looked a bit better, but then the stitching parts were all baggy, so I cut the backing fabric and wadding at the back of each design and added some extra wadding. Hey presto, trapunto! But then of course I had to fix the cuts in the fabric, so I used some of the iron on tape used for sticking bits of wadding together. Then, because it looked a bit of a mess on the back, I added a further backing. And then, to cap it all, when I looked at it after it was finished I realised that I'd stitched two blocks in upside down! Well, they're going to have to stay that way, and perhaps no-one else will notice! 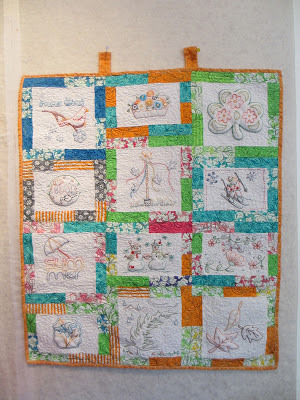 The little squares quilt is darling, I love the quilting you've done on it. It's amazing sometimes how different quilting lines can change the look of a quilt. I love the aurafil bom. It sounds challenging to have put together, but well worth it. I love the trapunto. I tried to stipple quilt a similar quilt top that I did with redwork and was so unhappy. I redid it in a crosshatch pattern and was so happy with it I'm afraid to do it any other way. All that snow and cold weather sure has led to a lot of creativity! Hi Amanda. Love all your projects, especially the hand embroidery one. Best wishes for a warming trend in your area. Missed quite a few of your posts. Love the quilt with the squares. Great, those notion blocks in it. Wow. I looked and looked but can't tell for sure which blocks are upside down. Great creativity in dealing with all the quilting issues. Nobody will ever know that wasn't the plan all along. Every time I see something you made I want to do something creative. Sigh... I'm afraid most of what I do are hemming, shortening, repairing. Ah well... I'll just admire your gorgeous works. They always make me smile. I went to your blog this morning as a reference, I knew that you had done the craftsy BOM 2012 March star block with square foundations instead of triangles and I thought I'd do that too. My star block was kind of a mess. Anyway, I ended up doing it but not as a star, as a cross, but your method was much better for me. I somehow had missed this post along the way. Your Sugar Block club block looks great and your little quilt is adorable. It makes me think of something that I heard once was that the difference between a pro and an amateur is a pro knows how to mend their mistakes. You sound like a pro to me. Great save. I know how you feel about upside down blocks. I did that on my great-granddaughters quilt and it bothered me, but I don't think that anyone else ever noticed. Hope your wrist is coming along.